Hornets Figure 8’s this Weekend! This year is the 50th anniversary of racing at Elko Speedway. We will be celebrating the events of the past much of the year, but the thing that is causing a lot of buzz to start the 2015 season is something new. The Figure 8 cars are returning to the track, well it’s more like a rebirth of the division… from the older full bodied heavy V-8 cars to the newer, front wheel drive 4cyl vehicles. The Figure 8 division was the identity of Raceway Park for decades, definitely a fan favorite. The Figure 8 races always seemed to have that extra element of danger, it seemed as though you might witness “the Big collision in the X” at any moment. The racing was always suspenseful as you waited for the cars to string out and the leader to catch the tail of the field. Would the driver at the back of the pack slam on his brakes to avoid a collision when they crossed? Just how close would these Dare Devils push the envelope? When there was a near miss, you would turn to your neighbor and say “he better back off next lap, or else!” You just had to wait one more lap and find out, who would have the guts to keep on the gas pedal, or is it the brains to back out of the gas. The collision in the “X” was rare, but when it happened it was spectacular, the crowd would gasp as one giant unit, people shared the videos on social media and talked about the crash with their neighbors. These are type of moments that get casual fans excited about racing and get them to come back week after week. When Raceway Park closed most of the drivers in the Figure 8 division retired and it was the end of an era. I suspect some drivers will build Figure 8 only cars and set them up to turn both left and right, other guys will race in the Hornet division all night long and just make minor air pressure adjustments from race to race. The corners are plenty wide to see 3 wide in the turns in addition to the action in the X. Expect growing pains as drivers new to this form of racing will be exploring just how close they can come to contact in the X. The Raceway Park Figure 8 drivers relied on trust and familiarity with the other drivers to know where the boundaries are, there will be little of that to begin with in a new division. Many drivers might take the “wait and see” attitude at first but the potential for growth is huge in the new 4cyl division and unpredictable might be the best description of the new Figure 8 races. I think in it’s 50th year of racing Elko Speedway is ready to handle a new breed of Dare Devils to emerge onto the racing scene. The Hornets Figure 8’s. The Hornet Figure 8 division will debut with Double Features on Saturday night May 16th at Elko Speedway. Spectator gates open at 5pm and action begins at 6pm. 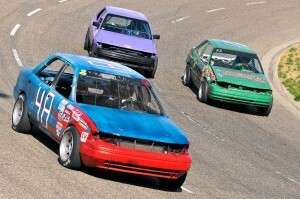 Get more information at ElkoSpeedway.com or call 952 461-7223.